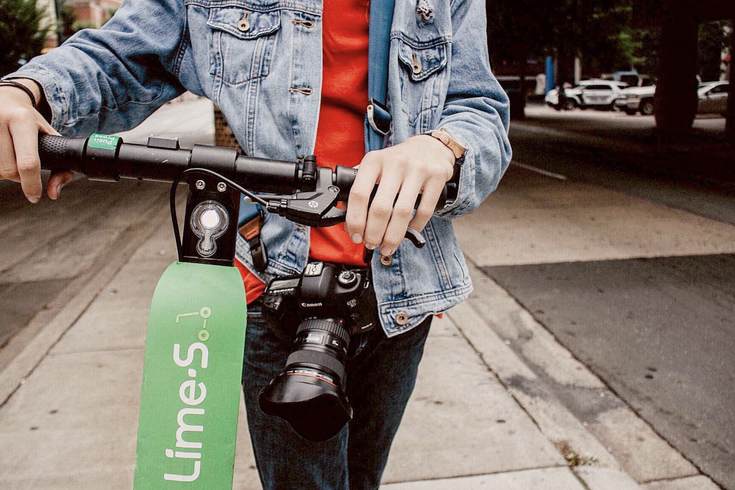 This photo shows a scooter owned by bike- and ride-share company Lime. Over the weekend, some of Lime's scooters being stored at a warehouse in the region made it appear that the company had begun operations in Philadelphia. But it was a false alarm. Turns out rumors that electric scooter company Lime had brought its dockless e-scooters to Philly just this past weekend are unfounded. The scooters appeared on Lime's app due to a "small technical mishap," WHYY's PlanPhilly first reported. An official with the Office of Transportation and Infrastructure Systems has confirmed to PlanPhilly that Lime employees had received e-scooters in a warehouse being used to store scooters on the East Coast, in anticipation of obtaining the proper permits. When employees turned the scooters on to test them, they were green lit on the app. But it was just a glitch; they're not for use yet. PlanPhilly reported there most likely won't be any dockless scootering in Philadelphia before spring 2019. Apparently OTIS is drafting some rules to manage companies that use dockless scooters and bikes and will hold a public hearing before the end of October. And Lime has to be obtain the proper permits first. City Council passed an ordinance back in June that paved the way for this kind of business, putting some regulations in place like obtaining permits, setting standards for safety, and setting parking standards. Dockless vehicles had a rough go just across the river in Camden, where a pilot program from bike company Ofo was cut short after less than 100 days and 80 yellow bikes were left in a warehouse.